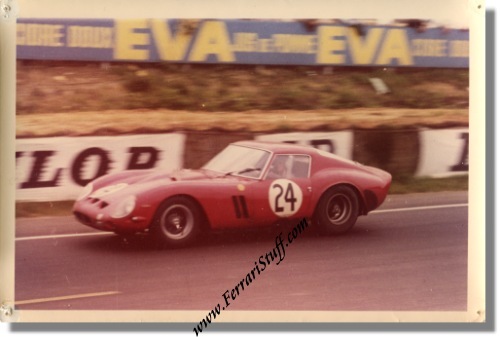 Vintage 1963 color photo of Ferrari 250 GTO S/N 4293GT at Le Mans. This is a vintage 1963 photo of the Nr 24 Ferrari 250 GTO of Jean Beurlys and Gerhard Langlois van Ophem en route to second place overall during the 1963 24 hours of Le Mans. The car, Ferrari 250 GTO with chassis number 4293GT, survives to this day and now seems to reside in the USA and Hong Kong. The photo measures some 18 x 12 cm or 7 x 5 inches and is in decent condition but at some point in its life it has been pinned to a wall and consequently it has 4 pinholes in the corners of the white border.